In 1960 in London at the time of clearing the site for construction of a new residential neighborhood, the old long-abandoned mansion belonged to Thomas Theodore Merlin was sent for demolition. In the basement of the home builders have discovered several thousand small wooden boxes tightly sealed. Imagine their surprise when they began to find inside the bodies of strange mythical creatures, which seemed to have been living only in fairy tales. In 1960 in London at the time of clearing the site for construction of a new residential neighborhood, the old long-abandoned mansion belonged to Thomas Theodore Merlin was sent for demolition. While visiting the Louvre last year, artist and filmmaker Julien de Casabianca was struck by an Ingres painting of a female prisoner tucked unceremoniously into a corner of the museum. He suddenly had an idea: what if he could somehow free her—both figuratively and literally—by reproducing her figure on a public street. With that single act, the Outings Project was born. While visiting the Louvre last year, artist and filmmaker Julien de Casabianca was struck by an Ingres painting of a female prisoner tucked unceremoniously into a corner of the museum. If you’re planning to visit Seoul this summer, the Trick-Eye Museum is a place you have to go and pose with 3D paintings and illusion paintings. These pictures below are enough reasons why you must visit here! If you’re planning to visit Seoul this summer, the Trick-Eye Museum is a place you have to go and pose with 3D paintings and illusion paintings. Most museums don’t like to see their visitors take pictures, some going so far as to charge them for the privilege. But this is not the case at the Art In Island museum in Manila, The Philippines. Here, visitors are encouraged to interact and have fun with the art pieces, taking as many photos as they want. “Art paintings are not complete if you are not with them, if you don’t take pictures with them,” Blyth Cambaya, the museum’s secretary. Most museums don’t like to see their visitors take pictures, some going so far as to charge them for the privilege. But this is not the case at the Art In Island museum in Manila, The Philippines. The Museum of Prado, located in Madrid, is one of the most famous art galleries in Europe, receiving thousand of tourists from all the globe every year. Japan has an entire museum based on bathroom habits. We're not sure what's stranger, the fact that it exists or the fact that people actually go there. 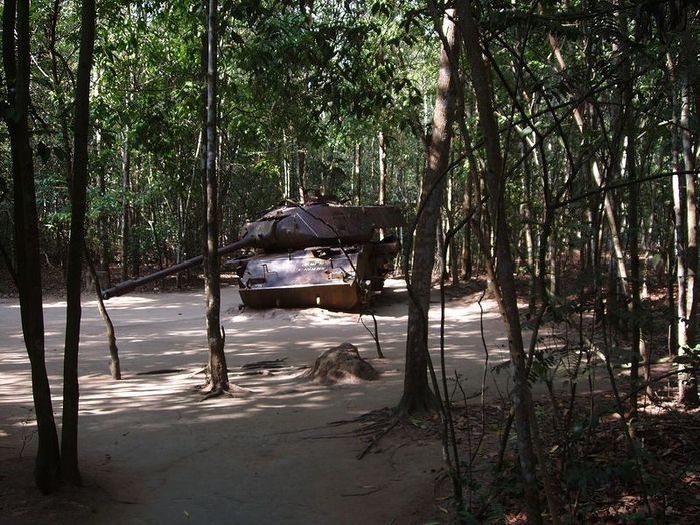 The tunnels of Cu Chi are an immense network of connecting underground tunnels located in the Củ Chi district of Ho Chi Minh City (Saigon), Vietnam, and are part of a much larger network of tunnels that underlie much of the country. The Cu Chi tunnels were the location of several military campaigns during the Vietnam War, and were the Viet Cong's base of operations for the Tet Offensive in 1968.